Elsie M. Campbell and Aunt Mimi's Quiltworks: Personal note to Followers...... Knee surgery over! Personal note to Followers...... Knee surgery over! Knee surgery is over. No surprises there. I had an old meniscal (cartilage) tear that required some smoothing out, a new tear which is what necessitated the surgery, and several places where the cartilage is worn through and allowing bone to rub on bone. Knee is recovering nicely, but I suffered a nasty fall in the bathroom at home only about 9 hours following the outpatient surgery, and caught the edge of the toilet in the right side of my back. Kind of like a big circle here. The meniscus tear was the result of a particular exercise prescribed by my physical therapist for my back pain. Now the surgery for the meniscus tear precipitated the fall which is really causing more back pain! I spent 4 hours in the ER yesterday for X-rays, and other tests to assess the new damage. It was determined there are no broken bones, thank God! So now, I just have to get through some days of healing rest, get back to the doctor on Monday to see if I need another back MRI to figure out if there is new soft tissue damage to the bulging discs, and try to get back on my feet yet once again. Stitches come out on Tuesday, and I'm hoping to get back to PT the following day, and water exercise class in two weeks. Tomorrow night, Miss Kitty's Quilters are going to be my 'guinea pigs' for testing out a new presentation about Color and Value. I'll probably be presenting it from a seated position, Ken will be setting up any and all media equipment, and friends will be holding up the quilts to make my points. One of my facebook friends reminded me yesterday, "If you fall down 11 times, just stand back up 12 times!" Believe me, I needed that quote. 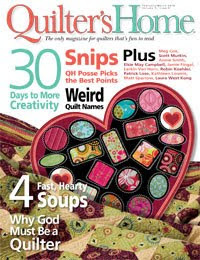 In the meantime, look for my name on the cover of the current issue of Quilter's Home magazine. I have a quilt in the magazine and there is a little page article about me inside. Then look forward to seeing an article I wrote about how I make my skinny bias applique in the upcoming June/July 2010 issue of Quilter's Newsletter, and a pattern for one of my quilts in a future issue of Ricky Tims and Alex Anderson's new magazine published by the American Quilter's Society: "Quilter's Life." There is a lot going on in my quilt world! How about yours? Elsie, hope you are recovering from your knee surgery and your fall. Yipes, sure hope there is no more damage. Rest and Recuperation sound like what you need! I'll be sending good vibes your way to help you heal! Your going to be as good as new with all these repairs. You just hope they all come with warranties. Hope you have a quick recovery! Glad to hear that your surgery went well. Best wishes on a quick and smooth recovery! Hoping you`re feeling better soon.